Stories about people and their connection to place are at the heart of what we do at The New York Times, no more so than within the real estate section. So today, I’m going to share with you three short stories, which I hope will serve as food for thought for your year ahead. I believe that storytelling is at the heart of communities, families and cultures. It’s also at the heart of memories. And as a passionate advocate of real estate brands, products and building things to make the process more enjoyable, especially in New York, I believe it’s in the DNA of what it feels like to own a home. As you can imagine, The New York Times is going through an exciting, unprecedented period of change. But in making our journalism actionable, we believe that true, future-facing value not only for our readers, but the users of the services we build, comes from bridging the gap between our journalism, and problems in our users’ lives. As such, we build tools for everyday living, built squarely upon the expertise and authority of our newsroom, with the clear premise that these tools become more valuable in our readers’ lives over time. In short, we believe that the future belongs to those who are relentlessly helpful, something we share a clear alignment with the Real Estate industry as it too continues to undergo seismic changes. We believe that this is the only way to grow a business in 2017. With that in mind, let’s dive in here. The first trend we’re seeing enormous momentum behind, especially at The Times, is Virtual Reality. It feels as if we’re finally at that tipping point where, after many false starts and promises of truly immersive experiences, we’re at that point where VR is going to hit the mainstream. With an aggressive democratization of the means of experiencing VR content, most notably through Google Cardboard, falling hardware prices fueled by Sony, Samsung, Microsoft, the gaming industry, and Facebook’s $2 billion acquisition of Oculus, it certainly seems as if 2016 is going to be the year where VR begins to gain some long-awaited traction. Indeed, combined with some truly innovative new forms of storytelling, late last year some of you may know that we distributed 1.3 million Google Cardboard devices through one of the oldest forms of distribution, the newspaper. But cutting through the hype, it’s probably going to be off to a slow start, with traction around gaming in particular only picking up towards the end of the year, especially when titles such as Minecraft begin to ship for the Oculus Rift around the holidays, and June’s Playstation VR headsets (which are rumored to be significantly cheaper than Oculus) begin to hit stores. 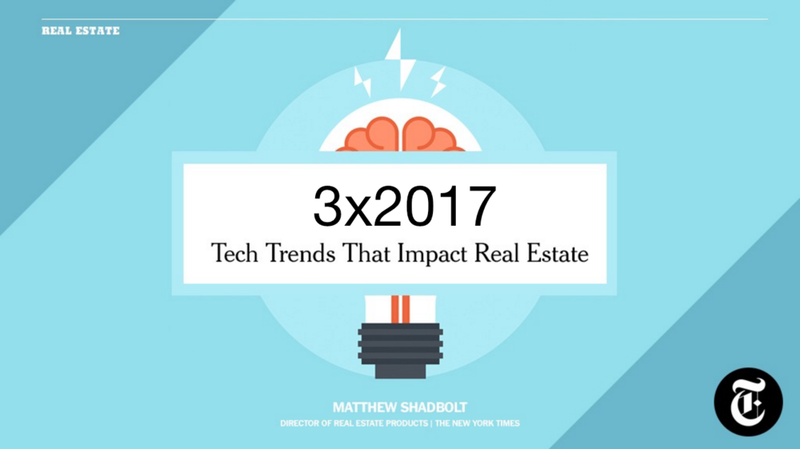 For the Real Estate industry, we’ve seen the growing democratization of VR through great folks like Matterport or Floored, but this is a much bigger opportunity. For those of you who work with international, or relocation clients, the opportunity to give them a remote, but truly immersive tour of your apartment might be something really special. We’re already seeing some of this via Google Hangouts, where the agent ‘drives’ for the client, but there’s also those agents who send the Oculus headsets around the world to prospective customers, especially in the commercial space, to let them ‘walk around’ the property themselves. So the dynamics of falling prices, and a growing democratization of the tools needed to experience this are certainly something to keep an eye on this year, especially for those of you who have kids. Second, it’s no secret that there’s more being produced than ever before. Indeed, as Erica Berger suggests, there’s a very real sense that the ecosystem we’re in right now is at highest editorial capacity for content, coupled with a shifting revenue stream away from publishers and to networks and large tech companies. That’s why she, and many other marketers suggest we’ve reached ‘Peak Content’. Not only is this an assault on our attention, but it’s also an increasing challenge to keep up with. Especially in the Real Estate industry, while there’s no shortage of things that agents ‘could’ be doing on social platforms for example, the overwhelming challenge is simply keeping up. Not only is producing enough content fraught with its own logistical challenges, just the effort to respond to all the different points of interaction in a genuine, consistently interesting way is incredibly time-consuming, and for many, just exhausting. For many of us, the tyranny of our own inbox is enough. Ultimately, it’s not unreasonable to expect that, at some point, the investment necessary to keep attention will be higher than the impact on revenue. And perhaps most shockingly, more than two million three hundred thousand emails go out every single second. Most of them from Inman Select signups of course (just kidding). And if you think about where that revenue is flowing, towards sites such as Facebook, Google, Amazon, or YouTube, the main point of differentiation is that these sites don’t actually create anything themselves. This, of course, bears close parallels with larger Real Estate portals, who while fantastically skilled at the assimilation and interaction of cross-platform search experience, are not the source of anything they present as a ‘result’. Now, I’m not suggesting we’ll see a reclaiming of content from any of these services, but in the spirit of being relentlessly helpful, and making your own knowledge actionable for your customers, the means of that distribution comes sharply into question. Ultimately we’re talking about the transference of value here, and for agents and brokerages in particular, the commoditization of listings data isn’t the question any more. The production of listings online isn’t either. So what is? For us at The Times, we hear from our users that finding listings isn’t a problem they have. But finding which neighborhood to look in still hasn’t been solved online, and this is a key value proposition when it comes to the agent. But very often that discussion is a cautious one based on Fair Housing implications. So how do you solve for finding that great neighborhood? I’m not talking about making blog-like ‘guides’, I’m talking about genuinely helping the user, in the moment, solve for something that’s a very real problem for them. And brokerage sites, this is a call to action for you. Digitize what’s inside your agents’ heads, and you might be able to play here. My last point is related to this idea of peak content, which is that given everything that’s being produced, curation as a philosophy is an obvious necessity, but as a business is a bit of an enigma. As Om Malik accurately describes it, ‘the problem with curation is that no one wants to pay for it’. This is no truer than for Real Estate professionals, who consistently have to distill all the information about the market, pricing, the process, inventory, neighborhoods or timing for each customer. In many ways, I think that Real Estate professionals are the ultimate curators. But very often that value proposition is in question, often eroded by agents less than willing to justify their commission check. This impacts everyone, even the perception of high-performing agents, and certainly the brand of the industry as a whole. Ultimately, the act of curation is about reflecting a point of view, but from a business perspective, sending people elsewhere very often doesn’t make sense. A great example of what I mean here is the difference between what’s served up in the search results experience online, versus what an agent does with their customer. It’s not about volume of results and comprehensiveness, it’s about empathy, guidance, insight and understanding. And it’s the key point of differentiation between an agent and a portal. So in shaping the experiences of our customers, curation is increasingly a challenge, not only given the amount of content being produced every day (we write the equivalent of a Harry Potter book every day at The Times for example), but also our need to remain relevant in our customers’ lives, AND our future customers’ lives. In many ways, ‘you are what you share’. There’s many agents who do this fantastically well, truly ‘owning’ their respective markets, but for too long these folks have been in the minority. So when we look forward to the kinds of technology trends which will shape Real Estate in 2016, keep an eye on the gaming industry in particular, as VR has the capability to hit our industry like a long overdue freight train, but also keep in mind that more is being produced than ever before, so distribution might be best thought out strategically, rather than from a ‘fear of missing out’ perspective. And lastly, curation is your key competitive differentiator, so use it wisely, sparingly, and stay relentless helpful as a means of remaining relevant. I hope you enjoyed my stories. Thank you.